Our President, Jon Karnon, looks back at the Association’s activities and achievements in 2016. This has been a very productive and positive year for the Association and for HSR. A great deal of our year has been taken up with responding on behalf of the HSR community to the large number of consultations on health reform and research funding. Throughout the year we have been working hard to raise the profile of HSR and show its real world impact on healthcare and population health. Initiatives have included growing our HSR webinar series and HSR blog; commissioning research with Newcastle University into the state and potential of health services research in Australia and New Zealand; engaging with clinicians and policy makers at our end of year Symposium and AGM and recognising the best health services research through our HSR awards. The threat of emerging infectious diseases is the focus of the latest issue of Public Health Research & Practice, which includes papers on mosquitoes, Zika virus and Australia’s response to the Ebola threat. The Australian Digital Health Agency (the Agency) is undertaking a collaborative consultation with government, the health sector, technology stakeholders and the Australian community on the development of a National Digital Health Strategy. The consultation process will conclude at 5pm AEDST on 31 January 2017. When women receive a breast cancer diagnosis they face choices not only about their immediate treatment but also about how to manage the risk of recurrence. For a growing number of women that involves surgery to remove a healthy breast. This study by Richard De Abreu Lourenco, of the Centre for Health Economics Research and Evaluation (CHERE) at UTS, which was nominated for the HSRAANZ Best PhD Prize, seeks to understand what factors influence this choice. 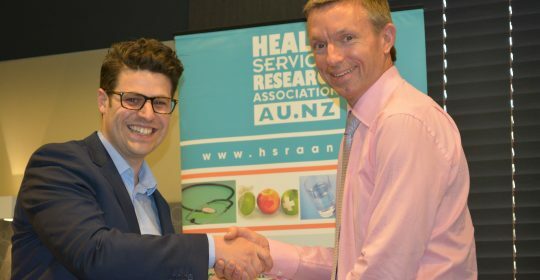 The best and most impactful health services research has been celebrated at the HSRAANZ Symposium and AGM in Canberra on 1 December. Leading researchers and policy makers gathered at the National Press Club to consider the future direction of health services research and heard from leading health services researchers about how their work is having real world impact. At the end of the event awards were made in the categories of Best Impact Project, Best Paper and Best PhD Student. Read about the Association’s new Executive Committtee announced at our AGM on 1 December 2016. And let our Executive Officer, Sarah Green know if you would like to get more actively involved with the work of the Association. Andrew Partington from the School of Public Health, University of Adelaide talks about his paper which won the HSRAANZ Best Quantitative Paper Award . Quality improvement initiatives in healthcare are not trivial pursuits. They require resources and engagement with clinicians and front line staff. Policy levers are needed to prioritise initiatives with the greatest ‘bang for buck’ to reduce the risk of seemingly ‘inefficient policy’ being scrapped. Andrew’s paper presents a case study of a practicable approach to using routinely collected data to compare risk-adjusted costs, outcomes and processes across providers and patient sub-groups. Such analyses improve on the use of singular, non-adjusted measures of performance to identify priority areas for non-trivial investments in time and financial resources to improve service quality. The winners of the HSRAANZ Best Qualitative Paper Award talk about their research on the reasons doctors provide futile treatment. There is evidence that doctors sometimes provide treatment at the end of life even though they believe it will not benefit the patient. However, little is known about why this occurs. Recent empirical research (96 interviews of doctors from a range of specialties in three tertiary public hospitals) undertaken in Australia has shed light on this. Doctors attribute this to a wide range of inter-related factors: characteristics of treating doctors (including their orientation towards curative treatment); attributes of the patient and family (including their requests for further treatment and prognostic uncertainty); and hospital factors (including a high degree of specialisation). This paper by Emily Karanges, which won the HSRAANZ Award for the Best Paper by an Emerging Researcher, describes trends in prescription opioid use in Australia over 25 years, since 1990, and maps these trends against major changes to opioid regulation and subsidy. Using data on both subsidised and unsubsidised prescriptions dispensed from community pharmacies and private hospitals, the study revealed a 4-fold increase in dispensing, as measured by defined daily doses (DDD)/1000 pop/day. There was a clear shift over time from short- to long-acting opioids and from weaker to stronger opioids. While regulatory changes had little immediate effect on opioid use, the subsidy of long-acting formulations and the expansion of subsidy to include the treatment of non-cancer pain were major precipitators of growth. With the uncertainty about the long-term efficacy of opioids in chronic non-cancer pain and current attempts to curb opioid use and harms, the impact of these policy changes on utilisation should not be overlooked. This paper from Robin Gauld and Simon Horsburgh which won the HSRAANZ Award for the Best New Zealand Paper investigated International Medical Graduate (IMG) perspectives on opportunities to share knowledge and experience with host country professionals and the mechanisms for this. IMGs from the UK registered with the New Zealand Medical Council were surveyed. 82% of respondents agreed colleagues were receptive to their knowledge contribution; 67% felt encouraged to share knowledge gained abroad; 60% felt encouraged to share knowledge of the UK or other health systems. Only 45% believed clear mechanisms were in place for knowledge sharing. Options for improving knowledge transfer include formal organisational arrangements, use of knowledge brokers and building communities of practice.